Aashish Ahujia (Playfair Team Leader), Dita Stanis-Traken (StARLink Secretary), Jane Ann Liston (StARLink Convenor), and Richard Batchelor (StARLink Treasurer) in front of the old station site in St Andrews. A campaign to see passenger rail services restored to St Andrews has been given more support. 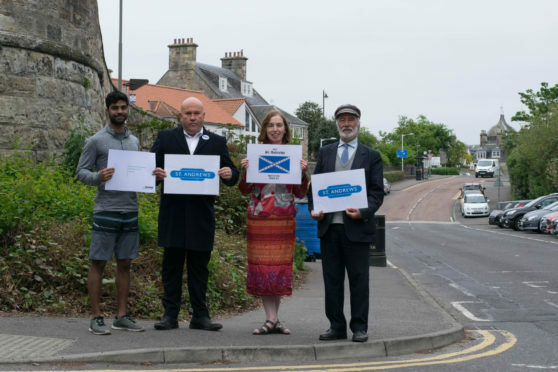 The St Andrews Rail Link (StARLink) campaign to reopen St Andrews railway line has taken a major step forward thanks to the findings of the Playfair Consultancy Group, which was commissioned to look into the issue and gauge people’s reaction to the prospect of seeing trains stop in the historic Fife town for the first time in decades. Over the past four months, the St Andrews-based business consultancy has investigated the viability of restoring rail services to the town and found most businesses are in favour of restoring the rail link. They also found not only was the railway strongly supported by students but also that because more than 90% of them travel outside St Andrews at least once a month, mostly to Edinburgh, the railway passenger numbers are likely to be higher than initially calculated. StARLink convenor Jane Ann Liston stated: ‘We are delighted with the findings and are very grateful to Playfair Consultancy. St Andrews was connected to the rail system from 1852 until 1969, when the line was cut from the network. The StARLink campaign was launched 20 years after the line’s closure in a bid to reconnect the town to the rail system and it has steadily built up support both in and outside St Andrews, lobbied politicians at all levels and raised money to support the ongoing campaign. “The Playfair report is a valuable addition to the existing work which has been carried out, including the Tata high-level report and the Peter Brett Associates (PBA) Policy Review, and will provide valuable input into the next appraisal stage which we hope to commission in the next few weeks,” he added.